I’ve previously tried using openMVG, but had limited success with matching failing frequently, and reconstructions not really working. I’ve now got past that inspired by some discussions on the openMVG google group. Basically, here I’m using OpenMVG to do the matching, and openMVS to do the dense reconstruction, meshing, and texturing. Rather than give you each command individually, I’ll just provide the script I’m using. If you copy and paste the below into a file and call it ‘openmvg_openmvs.bat’, you can put it in the directory of photos and just double click it. NOTE: You’ll obviously need to set your openMVG/openMVS directories to wherever you downloaded those binaries to, and I work by making a directory on my D: drive for processing. You’ll want to change these to your setup. (FYI: the beginning of my script is a clever little trick to end up with a model with the same name as the folder the script is run from, e.g. 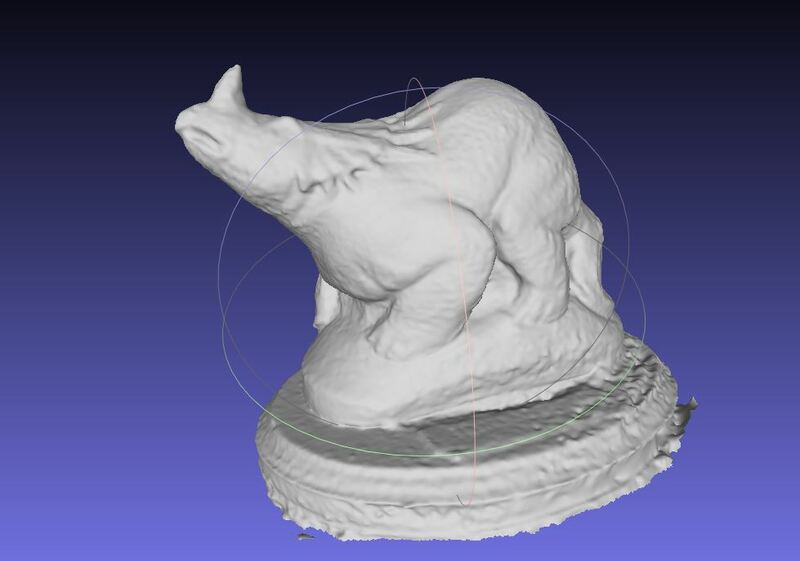 I put my test photos in a folder on my desktop called ‘Styracosaurus’, and at the end of the process I have a model named Styracosaurus.obj in D:\Styracosaurus). I’ve also left in my timing commands – you can remove them if you like. As you can see, that’s quite good, it’s pretty complete. Bit of a rough patch at the rear right, as is often the case with this dataset. Long story short, openMVG and COLMAP are both excellent, though COLMAP does prove to be quicker, it’s just conversion to openMVS that takes a little time – how well this scales with numbers of images remains to be seen. However, the dense cloud/mesh reconstruction portion is clearly the difficult part, and I’ve had quite a few issues with openMVS crashing when too much GPU memory is needed. The timings tell us that it was the refine mesh stage that was taking far, far longer than it now is. I thought it would be quicker adding the decimation factor. I was wrong! Attempting to decimate the mesh with openMVS during the refine mesh stage added a significant amount of time to the process. The ‘remove spurious’ I added to the reconstruction phase didn’t adversely affect timings, nor did exporting as obj instead of the default ply. Something is up with your numbers in general. Script execution or printout. There wasn’t a single time from the last set over 117 minutes. Both of these are over 120 each. Yeah, I need to figure out what’s going on. I’ll re-run some of my previous scripts/commands. Either I’ve changed a variable for openMVS here (likely), or something weird is going on… maybe Spectre/Meltdown patches are slowing this down? Quick test using VisualSFM to match – my previously reported time for sparse reconstruction was 95 seconds, but it just came in at 110, which depending on how you look at it is ‘just 15 seconds’ or ‘a 16% increase in time taken’. Good catch on this Timothy – post is updated with ‘proper’ parameters (or at least consistent with previous tests) and both workflows are at 37 minutes now. Yah I had noticed a SMALL slowdown in some areas after the meltdown / specture update in only some areas but double was a bit strange. Glad to see it worked out! Thanks for posting these tests, very useful. I wonder how COLMAP’s dense point cloud could be exported to reconstruction in OpenMVS. That would be something. I believe the camera positions are lost for some reason when you export it, whereas sparse works great. Thanks for the article! Would it be possible to reduce the time spent to generate the mesh down to less than 5 minutes if one is willing to sacrifice on quality? Absolutely. increasing the ‘resolution-level’ flag will reduce photos down more before dense reconstruction/refinement. Is there a way to disable intrinisics and if so what command do I use. Hmm, sorry – that’s not an issue I’ve come across and I don’t think you can disable intrinsics. Is it correctly finding the sensor database? Dataset info:Views count: 1”. Not sure how to fix this so I am asking please for your assistance. Sounds like you don’t have enough overlap between photos. 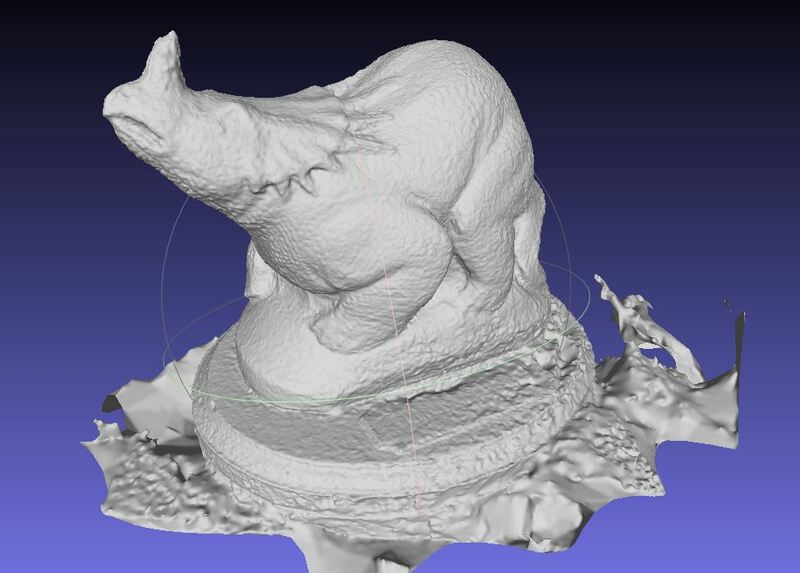 Does the photoset work in any other photogrammetry pipeline, e.g. meshroom? It also doesn’t work in Meshroom. The dataset contains 3 views of a sketch (Left, Right, Top/Back) and to use those sketches to create a 3D model. This is for my thesis which is Multiple View 3D sketching. Does the dataset need to have many images? The 3 viewpoints of the 2D sketch have enough overlap between features of for example, ears, nose and tail. (of a cat). Can you share the photos? Or are they 3 sketches? I don’t think sketches will work, and even for photos you’ll probably need quite a few more images. For something akin to what you’re doing, you’d be better deciding what angle these are drawn from, then importing them into a 3D software package like Blender, and using them as a guide to sculpt the model from scratch. Do you think that this are still the bets programs to use? Did you try Meshroom and Meshlab? I should update the header on this page. Also check out the blog generally, I’ve scripts etc for mushroom.